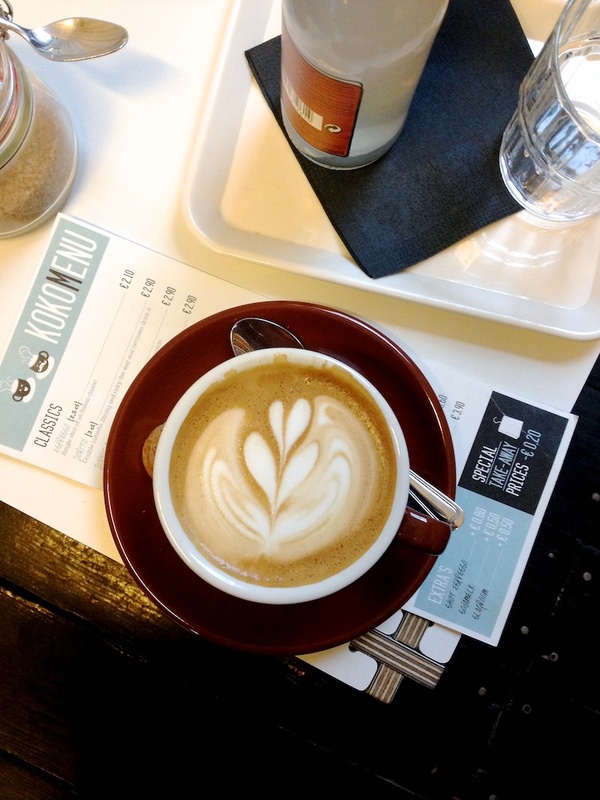 A few weeks ago, I had the pleasure of spending a weekend in Amsterdam, a place I hadn’t been to in years and whose small but vibrant specialty coffee scene has grown significantly in recent years. 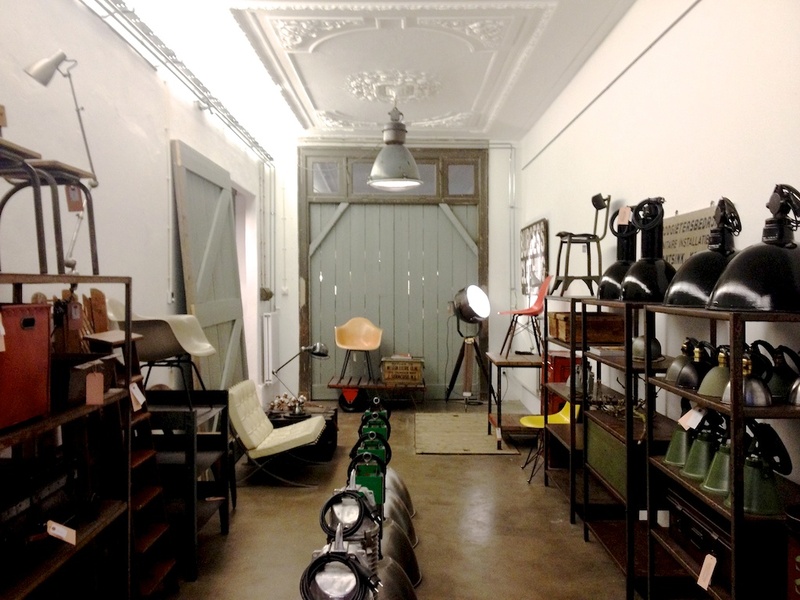 While the number of quality shops are growing, it’s still possible to visit most, if not all, of them during a short visit and still have time for some of the city’s other cultural and recreational treasures. 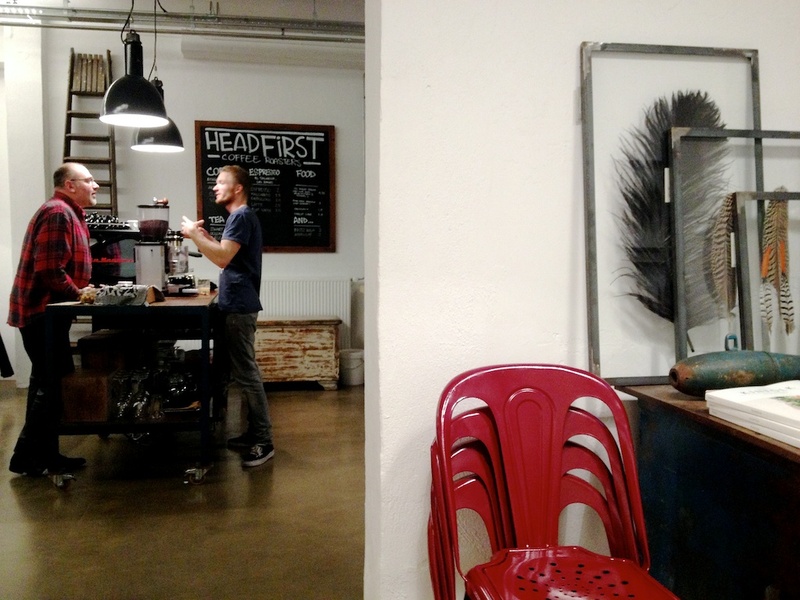 The evening I arrived I headed directly to a gathering of local baristas for a Friday Bean Battle, which is basically a TNT (Thursday Night Latte Art Throwdown) that takes place on the first Friday of every month. The event was being held at Espresso Fabriek, one of the staples of the specialty coffee foundation in Amsterdam. 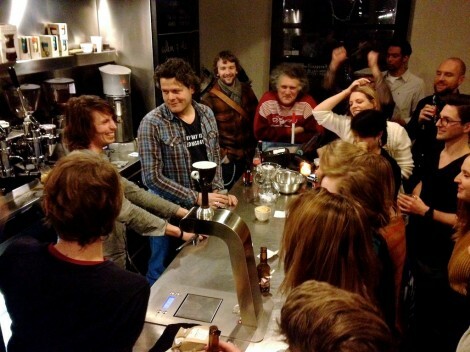 There is no money or points involved in the battle, just a cool little trophy that’s displayed at the shop of the winning barista until the next competition. It was a fun introduction to some of the people I’d be visiting around the city over the coming days. 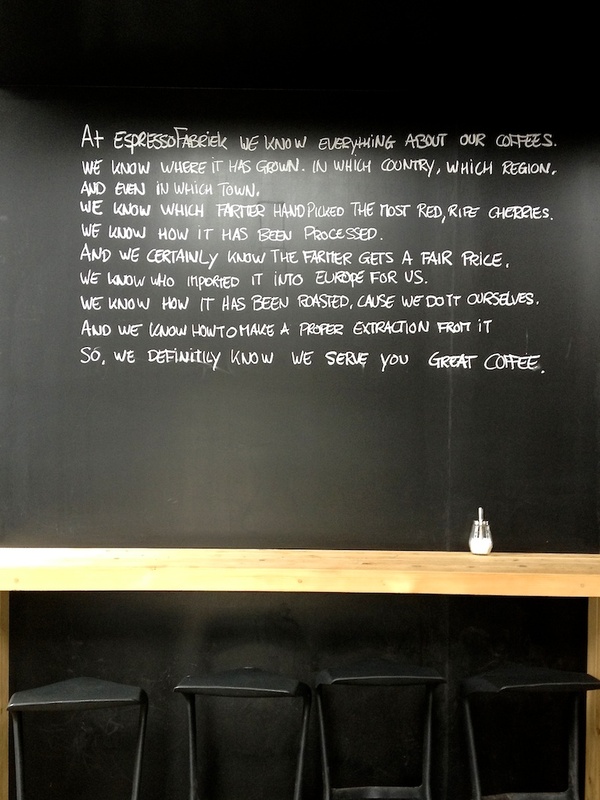 As one of the first small specialty coffee roasters in Amsterdam, Espresso Fabriek has helped build a foundation for what is now a growing market for lovely coffee bars and cafés across town. They currently have two locations, the first can be found at Westergasfabriek, a former gasworks factory that is now a renovated hot spot for creative and cultural entrepreneurs near Westerpark. The second location is a bit further east of the city in a residential area, which I didn’t visit on this trip (IJburglaan 1489). Espresso Fabriek can be found behind the main buildings inside a smaller one that once housed gas meters for the nearby factory. It is now an airy two floor loft, with a coffee bar on the ground level and a Giesen roaster with extra seating up above. 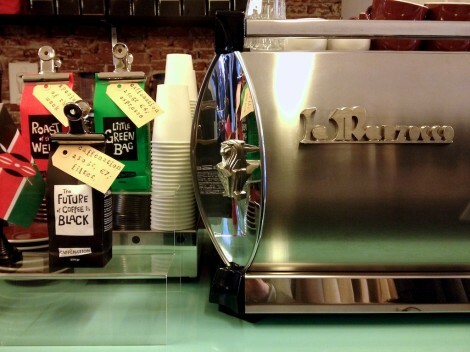 There’s a 3-group Kees van der Westen lever machine as well as slow bar with V60s and AeroPress filter coffee available. Be sure to try a slice of the Apple cake. 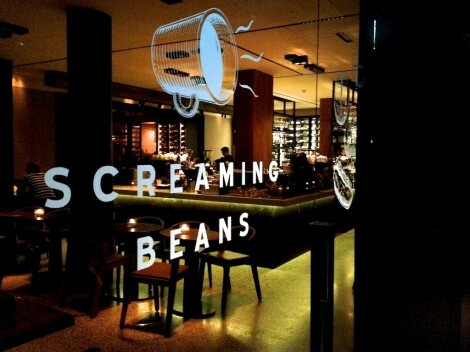 Screaming Beans is another company that has been a staple of the Amsterdam community who serves coffee roasted by Bocca. 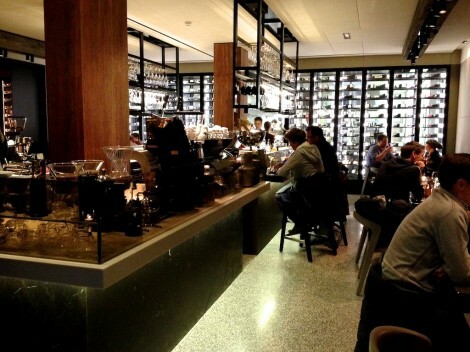 In the last year they’ve refreshed their original location with a recent remodel and opened a second location that doubles as a well stocked wine bar and restaurant—complete with tasting menu. The wine bar takes the format of a typical coffee shop and throws it out the window. 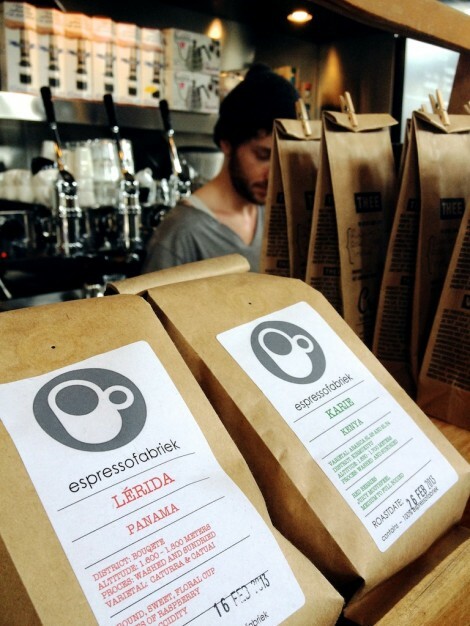 It offers an experience of fine dining and elegance that won’t have customers questioning the cost of a Chemex. 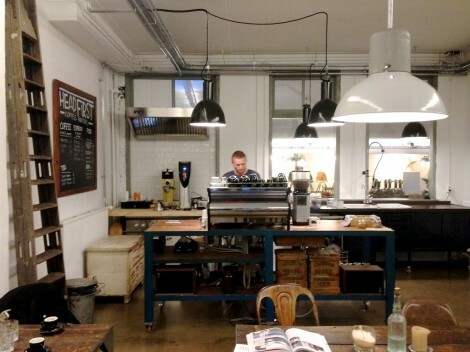 Stationed in front of the glowing wine cellar are dueling Kees van der Westen lever machines, an Über boiler and a myriad of different brew methods to choose from. The original location, which just re-opened last month in a popular shopping district, has a more traditional café menu, with weekend brunch and pastries along with a fully equipped coffee bar up front, which is also outfitted with a Kees van der Westen lever machine. The space is long and narrow with a bright white wall that reflects light into a nook that’s adorned floor to ceiling with lovely reclaimed wood. 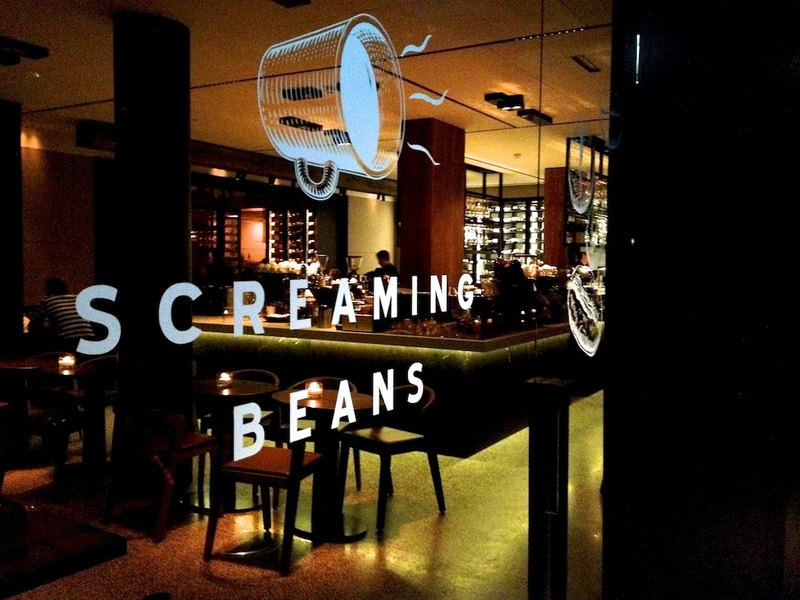 What impressed me most about both of the Screaming Beans locations is their dedication to table side coffee brewing, which really elevated the experience to new levels. 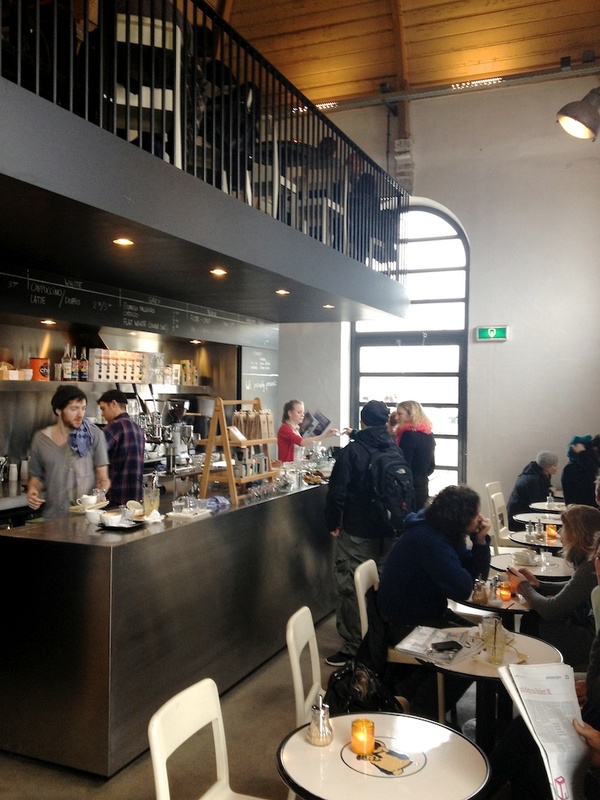 Coffee Bru is located south east of the city and is a bit out of the way for most travelers. However, if you have the time it’s a journey that will take you to parts of Amsterdam you would otherwise probably never visit. 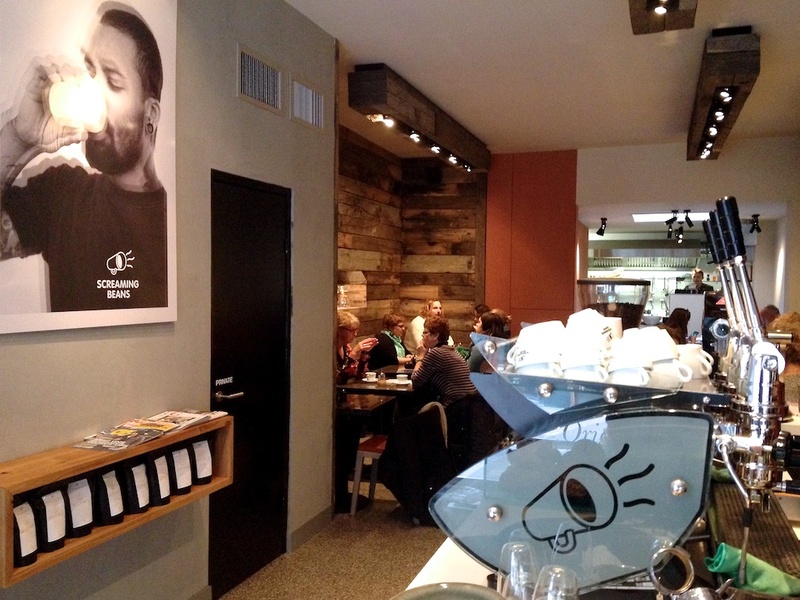 This café has only been open for about a year and a half, but it has the feeling of a neighborhood institution. It’s less modern than the other shops around town and much more bohemian. 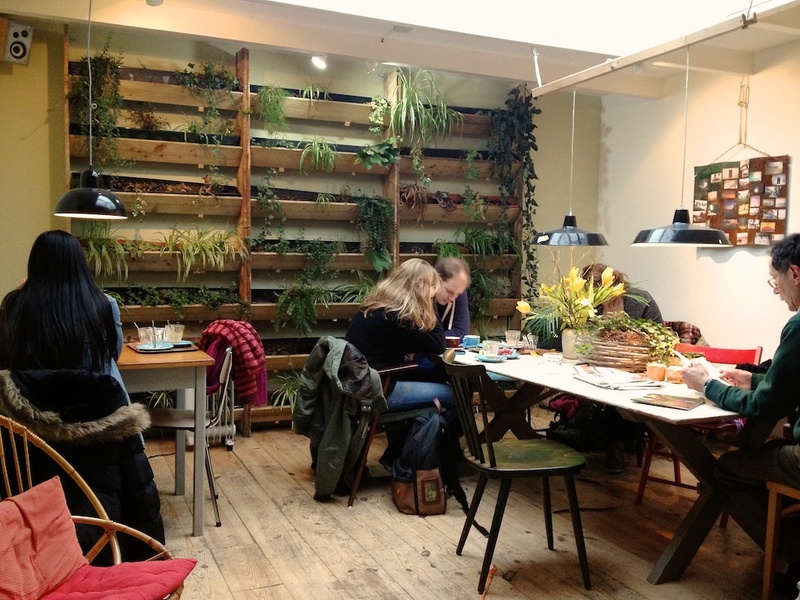 There’s a corner full of toys for the kids, a living plant wall in the back room and a menu offering vegan friendly fare. The coffee bar is built on a brightly tiled island that feels like you’re in someone’s kitchen. The baristas serve coffee roasted by Bocca on V60s and espresso was pulled on a La Marzocco. 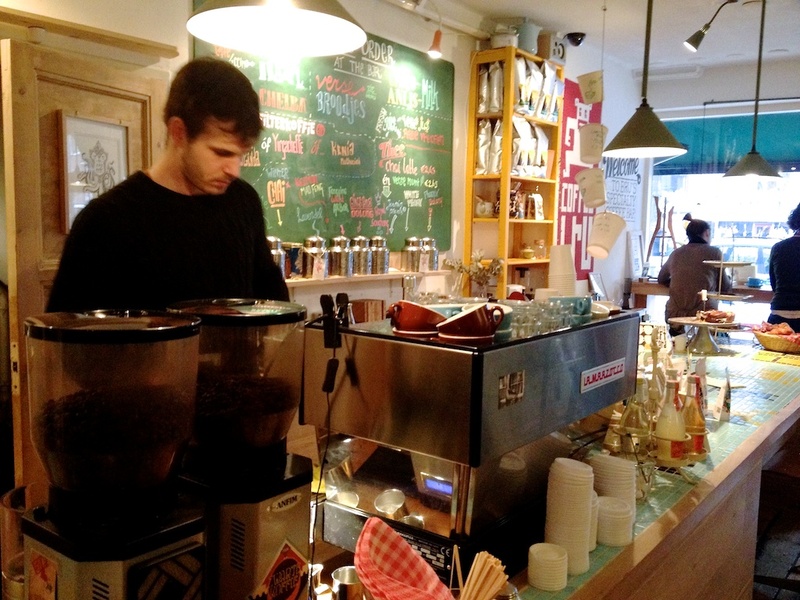 I had my best cup of filter coffee here, but the least welcoming service. 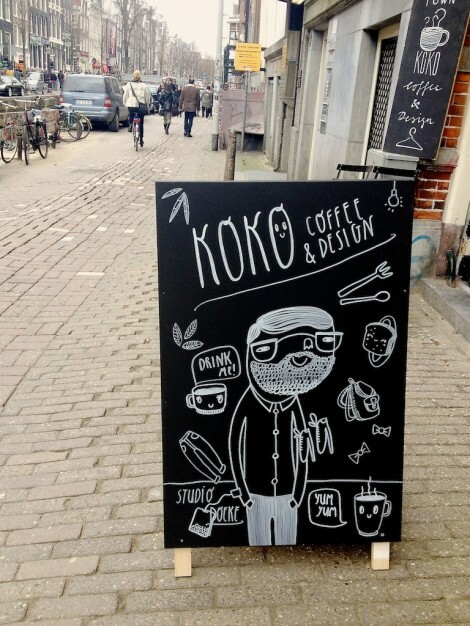 KOKO Coffee & Design was a favorite of mine on this trip. The shop has only been open for 6 months, but it already seems to have a stream of regulars taking advantage of the inspiring surroundings and great coffee. 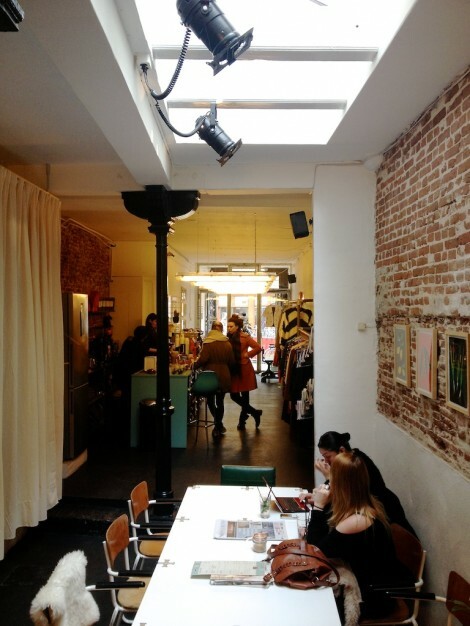 The atmosphere, the location, the concept and the coffee where all fantastic and the service by the lovely owners Karlijn and Caroline was warm and welcoming. 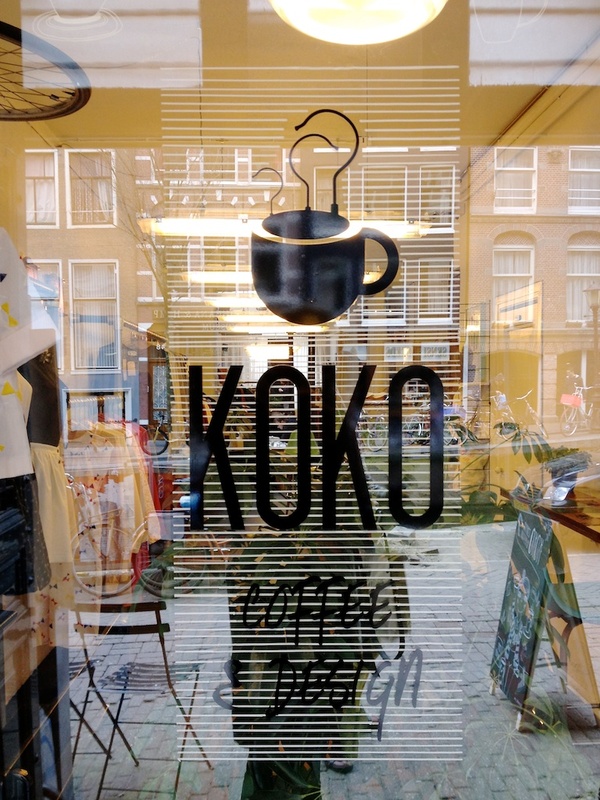 KOKO is located right in the heart of Amsterdam, with a front door that sits just across the canal from the Hash, Marijuana & Hemp Museum. Its presence is unsuspecting and greatly appreciated in this part of town. The space is part coffee bar that uses beans roasted by Caffenation in Antwerp, Belgium and part design boutique that sells clothing and other accessories from exclusive designers that can’t be found elsewhere in The Netherlands. 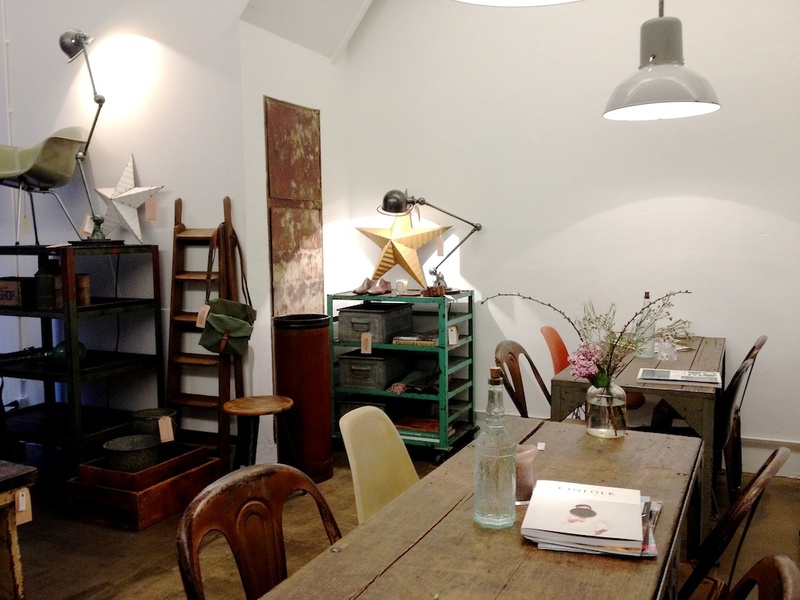 There is a variety of vintage furniture for lounging and well-lit tables for working or sitting with groups. All of which share the space harmoniously with racks of designer clothing and rotating art exhibits on the walls. I could have spent all day sitting here reading through old magazine and sipping a cappuccino, which was the best I had on my trip. Headfirst Coffee is the newest coffee shop in Amsterdam and will soon be the newest specialty roaster as well. 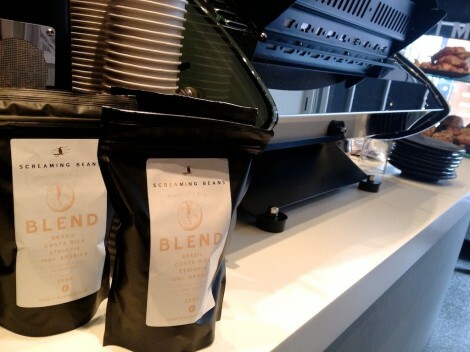 When I visited, they had only been open for a month and were using coffee roasted on a friend’s machine while waiting for their new Giesen roaster to arrive. 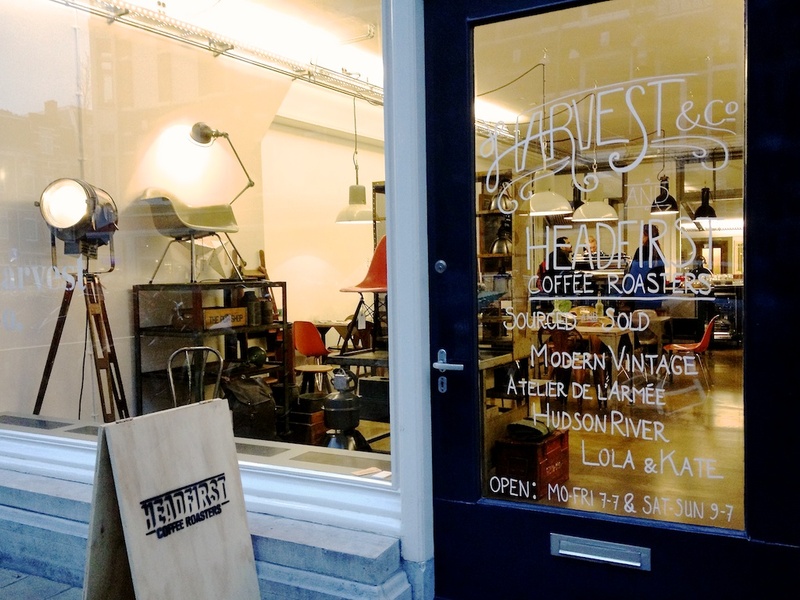 The owners of Headfirst, share the space with another business called Harvest & Co that sells vintage furniture, home accessories and other lifestyle goods that transform the space into one you’d find on the pages of Kinfolk as well as Barista Magazine. 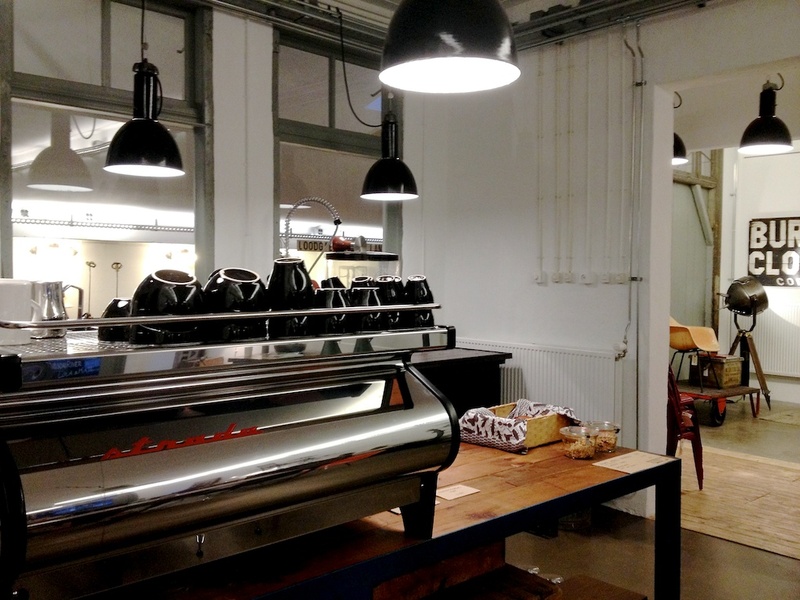 The space here is warm and inviting and the bar is simple and understated with little to distract from the shiny new La Marzocco Strada, which takes center stage. The filter coffee was brewed with an AeroPress while I was there and the single origin espresso was singing with brightness and balance. 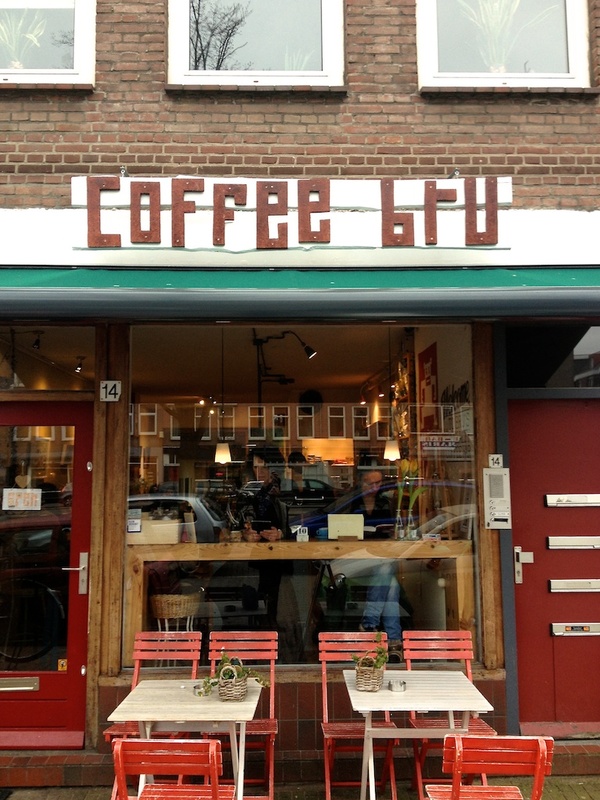 The owners will soon be roasting themselves in the back half of the shop which will introduce more customers to the process behind their cup and adding even more to the quickly growing coffee scene in Amsterdam. 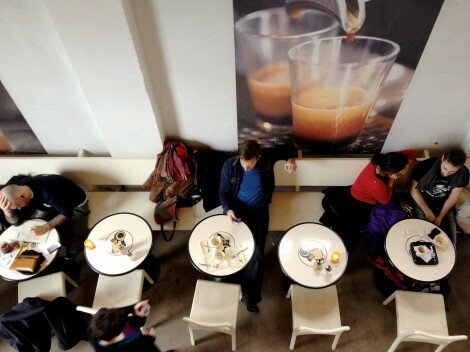 There’s so much activity in Amsterdam and the coffee shops have all taken their own unique approaches to the service they provide and the atmosphere they’ve created. 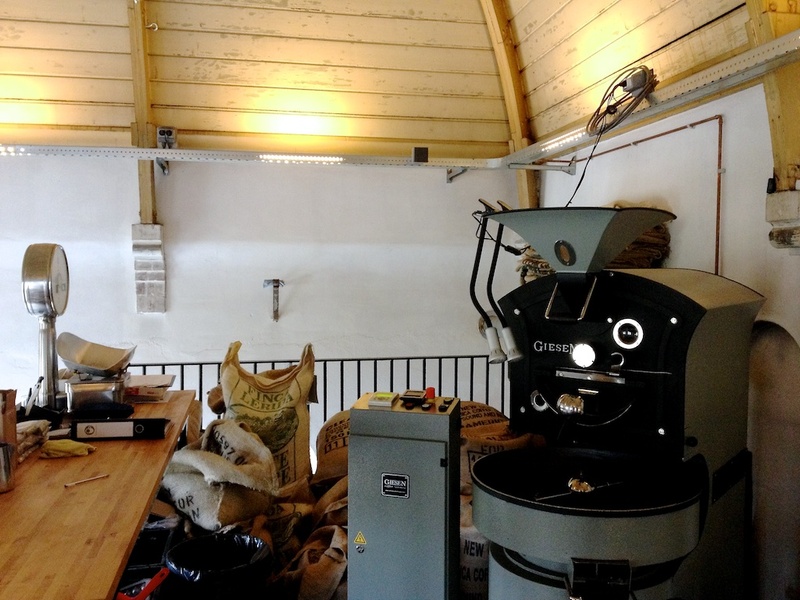 If new shops continue to open up at the same rate as they have in the past year, Amsterdam will soon find itself as one of the leading specialty coffee hubs in Europe. Wow. Epic post. 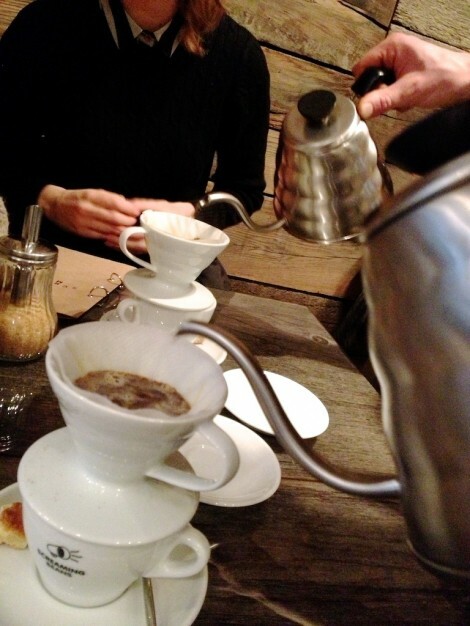 When I had a long layover in Amsterdam a couple of years ago Screaming Beans looked after me well. 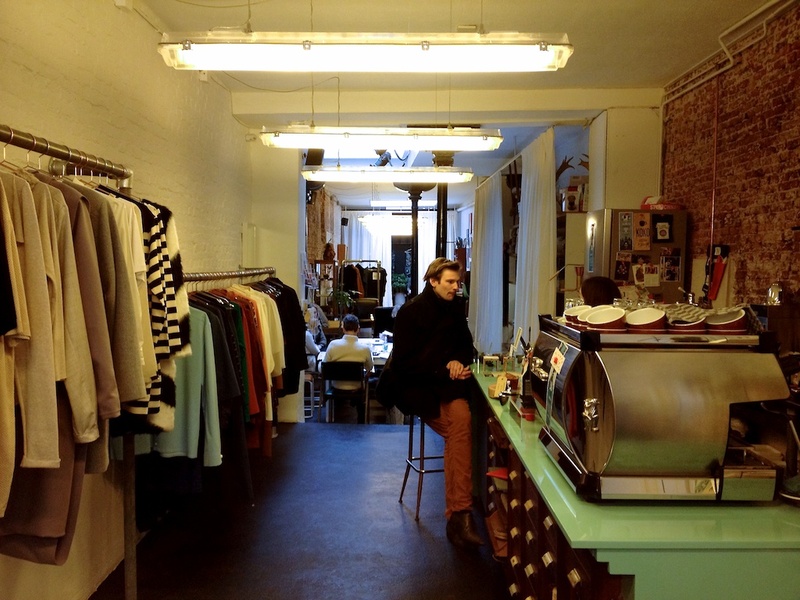 There also was an incredible pop-up shop down the street called SOK Espresso Bar run by a former Dutch Barista Champion. By the looks of things I need to get back. Thanks for this extensive guide. I’d like to point out that Headfirst is already roasting their own coffee, they just don’t own a coffee roaster yet. They’re using a machine owned by their coffee roaster importer, but they’re definitely doing it themselves! Thanks Linus, I must have misunderstood, I’ll update the article.